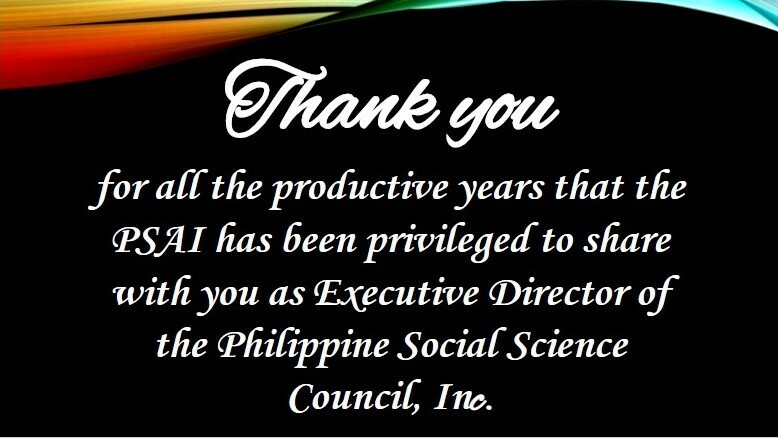 The Philippine Statistical Association, Inc. (PSAI) conferred a token of gratitude and certificate of appreciation to Dr. Amaryllis Tiglao-Torres, outgoing Executive Director of the Philippine Social Science Council, Inc. during the Joint Meeting of the Outgoing and Incoming Board of Directors of the Association on 8 January 2019 held at the 8th Floor, CRS Bldg, PSA Complex, East Avenue, Quezon City. Dr. Torres is also Professor Emeritus at the University of the Philippines, where she received her doctoral degree in Psychology and has been teaching for almost four decades. Aside from teaching, Dr. Torres served in various administrative capacities at UP, including Dean of College of Social Work and Community Development, Vice Chancellor for Academic Affairs, Director of Office of Research Coordination, and Chairperson of the Department of Community Development. Dr. Torres is one of the leading authorities on gender-based development issues. She has written extensively on the experiences of women within the Filipino family structure, formal and informal societal institutions, work spaces, and the democratic fora as well as their portrayals within certain bodies of literature. Her research concerns the different dimensions of gender inequality, including their manifestations, causes, conditions that perpetuate them, and the consequent repercussions of inequality to the state and its constituents. Emphasizing the benefits and potentials of gender-based development programs and policies, Dr. Torres has lent her expertise to various international organizations such as UNICEF, ILO, UNESCO, AUSAID and ASEAN. In addition to teaching and research, she has held positions in government and professional organizations, as follows: Commissioner, National Commission on the Role of Filipino Women; Chairperson, Committee on Social and Human Science, UNESCO National Commission of the Philippines; and President, Psychological Association of the Philippines.